There I was on a metal bench in a small park on the grounds of Fairview State Hospital in Costa Mesa, California, with my Saintly wife, when I observed the impossible/unbelievable spectacular daredevil stunt happen multiple times. We had arrived early for a disabilities conference scheduled at the hospital. The meeting was a requirement for me as Chairman of the Regional Center Board of Directors. The idyllic park was away from the noisy rush on Harbor Boulevard and was a peaceful, relaxing, beautifully landscaped spot to while away time. An abrupt "Pow!" noise was heard. My wife said, "What's making that noise.?" "You're talking about that pop sound? "Yes." she replied. "It sounds close but there is no one around." "Pow!" There was the loud clap again. The sound was like a popped balloon or a loud cupped hands clap. I commenced eye balling all around me for the source of the noise. Finally, I looked up to see if anything airborne could create such a noise. 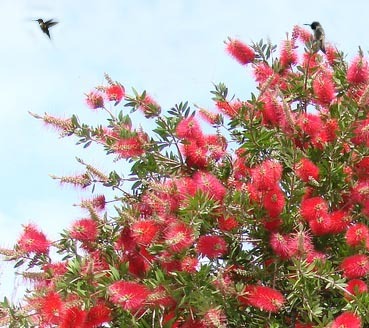 At the very tip-top of a twenty foot high Bottle Brush tree perched a motionless hummingbird. The bird was facing left and slightly forward from our location with head tilted up. My eyes followed the direction the bird was looking. I spotted a second hummingbird hovering about 30 feet away and 10 feet higher than the watching hummer. The hovering hummer was directly above the intersection of two sidewalks. Suddenly, the hoverer dived straight down at the sidewalk going from a blur to invisible. I sat up in fear of the zipping bird impacting the concrete junction. I hardly moved an inch before the "POW!" as the speeding hummer became visible again, hovering only inches above the sidewalk. Then he zipped back up to his high perch and commenced hovering again. My wife and I were awe-struck. I asked, "Did you see that?" She replied, "Yes, and it frightened me. I was certain the crazy bird would kill itself!" Neither of us had heard of hummingbirds performing such a dangerous maneuver. The single spectator of the noisy humming boomer gave no indication that she was impressed with the trick. The mach busting invisible death defying dives continued at the rate of about one dive per minute. "POW!" We were impressed even if the female hummer was bored. Talk about a show off! Come to think of it, my octofleugerons off the 3 meter diving boards were to show off for the girls and other spectators around the swimming pool. Why not the Hummer Boomer? Reluctantly, we had to leave with the sonic boomer continuing his daring performance. I sure hated to leave such a stunning demonstration for the sleep inducing meeting that lay ahead. What I saw that day I have never seen since and I doubt if many others have seen such remarkable stunts by a hummingbird. Such flying skill, daring, boldness and showmanship are normally seen only in American Fighter Pilots. Maybe we have another example of reincarnation.